Al Gore, Chairman, Alliance for Climate Protection. Corporate executives gathering to talk about how their companies can be eco friendly in this economy at the Bacara Resort, in Santa Barbara, California, on March 5, 2009. Yeah, my nose is seriously out of joint. Former vice president Al Gore was in town last Sunday, and I didn’t know about it. Worse yet, I didn’t get invited. Houston, that’s a problem. I make a point to not attend all kinds of events like this. But for me to truly not go, I need to be invited first. That’s how it works. 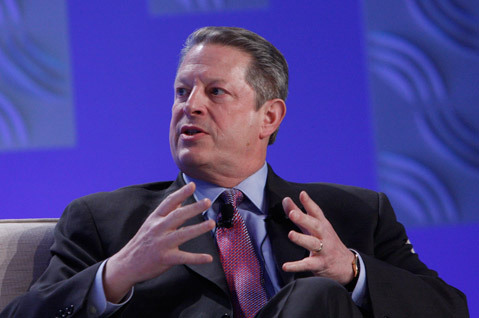 It should be acknowledged I was never a huge Al Gore fan — he seemed to walk around in a state of clueless hubris. But it’s indisputable Gore definitely had the 2000 election against George Bush stolen right from under him. Bush then wound up getting us into two wars in the Middle East that to this day we are still fighting. I blamed that on Gore’s annoying android persona. Since then, the former veep has done an amazing job reinventing himself. He now comes across as a really smart guy who has learned to make genuinely self-deprecating jokes while pursuing a very serious mission. Like former prez Jimmy Carter — another driven megalomaniac from the South — Gore continues to make a much bigger contribution to the planet pursuing his post-political career than he ever did as an elected member of the power elite. Somewhere along the way, Gore got religion on climate change. With his groundbreaking film, An Inconvenient Truth — a PowerPoint presentation masquerading as a documentary — Gore managed in 2006 to make a jeremiad about extreme weather a pop-culture phenom. No longer was the issue the exclusive domain of wonky guys in white lab coats who spoke a language that was hard to understand. We could all freak out. Earlier this year, Gore released An Inconvenient Sequel — a 10-years-later look at the state of climate change — which somehow manages to be both angrier and more hopeful than the first. Gore used to live in Santa Barbara briefly, Montecito to be precise. This past Sunday he was back in town visiting his ex-wife and daughter who still live here. But he was also here at the instigation of Santa Barbara movie mogulista Roger Durling, who was screening Gore’s sequel in Durling’s new and vastly improved Riviera Theatre. Invited to watch was the cinematic equivalent of superdelegates, Industry people who have ballots to cast in this year’s Oscar elections. In other words, Gore was politicking. The timing could not have been any better. Or worse. When Gore showed up, Santa Barbara was just digging itself out of the Thomas Fire, the biggest ever in state history. Still on the way were the pelting rains that sliced the south-facing slopes of our backcountry, scalped raw by the Thomas Fire. We knew they were coming; we just couldn’t imagine how bad they would be. Not every natural disaster can be blamed on climate change. Behind its sunny façade and swaying palm trees, Santa Barbara’s climate has always been one of brutal extremes. Feast or famine. But in recent years, those extremes have grown more volatile, more violent. Our latest drought was the worst in recorded history. This fall was the second driest fall ever. Our summer the hottest since 1859, when pelting heat reportedly caused birds to drop from the sky, mid-flight, like so many drops of rain. Santa Barbara’s fire season, formerly a four-month window of doom, now runs year-round, much like the NBA basketball season. The truth has gotten both inconvenient and obvious. Had I attended the film screening, I would have heard Gore explain how the direst scientific warnings predicted in the film he made 11 years ago were not borne out. The truth has actually been much, much worse. Extreme weather events occurred much sooner, much more dramatically, and with greater frequency than even his grimmest doomsayers anticipated. Things that should not have started happening for another 20 years are already unfolding. “It’s like a nature hike through the Book of Revelations,” Gore said during a panel discussion after the screening. It’s a good line; I think I’ll steal it. under the dubious new rubric of achieving “energy dominance.” (It’s worth noting that Florida’s coast has just been exempt from new leasing proposals because Florida’s governor is a Republican running for Senate and offshore oil is hated there almost as much as it is in Santa Barbara.) And yes, there are no fewer than 700 new onshore oil wells now proposed for Santa Barbara County, near Cat Canyon, that will soon be coming before the county supervisors for approval, all relying on the energy-intensive technology known as cyclic steam injection, a kissing cousin to fracking. But even while all this is transpiring, global investors have figured out there’s money to be made on alternative energy sources like solar and wind. As solar prices have dropped, production has increased. As production has increased, prices continue to drop. Not just “impressively,” but dramatically. Compellingly. Anyone genuinely interested in “energy dominance” would invest with the same sort of government subsidies and tax loopholes that the federal government has long afforded the oil industry. It can make a difference. Last year, the tri-counties just hit a major solar milestone, producing for the first time one gigawatt of solar power. The Hoover Dam, by contrast, produces two. In the meantime, Roger, if you don’t want me to come to your movies, just invite me. I won’t go.